The Brickade is roughly based on the military Navistar and on the RG-12 APC produced by Land Systems OMC. 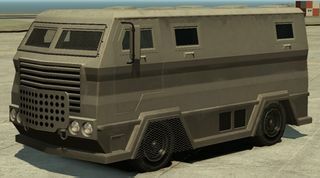 Its a large but stumpy and generic [[wp:Armoured bus|armored bus-like]] van, similar to the [[Securicar]] (which interestingly bears a similar "Stockade" badge), but adopts a cab-over design, a beige bodywork and much smaller wheels. In addition to a thick body shell, the Brickade is also equipped with plating that protects the front radiator grill, as well as steel mesh grating covering the front windscreen and wheel wells (which does not actually protect the Brickade's tires from gunfire). The Brickade is implied to be associated with the [[LCPD in GTA IV Era|police]], as it has a [[Police Radio|police radio]] and the ability to pass through [[tollbooths]] without paying. However, unlike most police vehicles, the Brickade can use a [[Pay 'n' Spray]]. Although it bears no badging, police chatter implies the Brickade is manufactured by [[HVY]]. Despite it having 2 doors in the front and 2 doors in the back like the Stockades, it can only fit 2 people in it as the back doors are not programed to open and fit people in the back like the stockades can. This is because it is a unfinished project. The upper area is a faded gold color, in the middle it has brown stripes with a faded gold color below it. Not even online multiplayer car mods can change the color of it. The only thing the mods can change on it is the color between the area the door opens and closes, otherwise its main body color is the same. The area in between the door can be red , black, or silver depending on the Brickade that was spawned. If you take the Brickade to a [[Pay 'n' Spray]] it will only spray one color. One possible reason that it lets you take it to a Pay 'n' Spray when it is classified as a police vehicle is the fact that its a unfinished project and rockstar did not program the Brickade to be rejected when attempting to respray it. The Brickade is also considerably hardened to handle selected forms of damage to an extent, to the same degree as the [[Enforcer]], [[Police Stockade]] and [[Securicar]]. The vehicle can absorb large amounts of gunfire, but will eventually succumb to engine damage, especially when it is shot at its weakest point in the front, where the engine is. The Brickade can also survive six direct hits from [[Explosive Shotgun|explosive shotgun rounds]] (at any part of the vehicle) before its gas tank ignites and results in the vehicle exploding (three times the amount of a regular car). * Despite the Brickade and the Buffalo being two different vehicles they have similar horns. * The '''Brickade''' was originaly going to be featured in multiplayer. It was going to be a roadblock for the bridges at a 6 star wanted level only in multiplayer freemode. * One possible reason Rockstar removed it is because in the game files it says that firemen were to drive it ,it was locked on the program setting. Then once it was fixed it would not spawn at all, so Rockstar may have decided it would be better to remove it. * The Brickade is the most durable (Front Engine) vehicle in the [[Grand Theft Auto IV era]].